Once again, the herbs on my deck are dictating my meals (and in this case, my beverages). The Rosemary is quickly getting taken over by its aggressive neighbor, Mint. It's out of control. So what to do with all of it? Mojito's, of course! But not just ordinary Mojito's... Watermelon Mojito's! 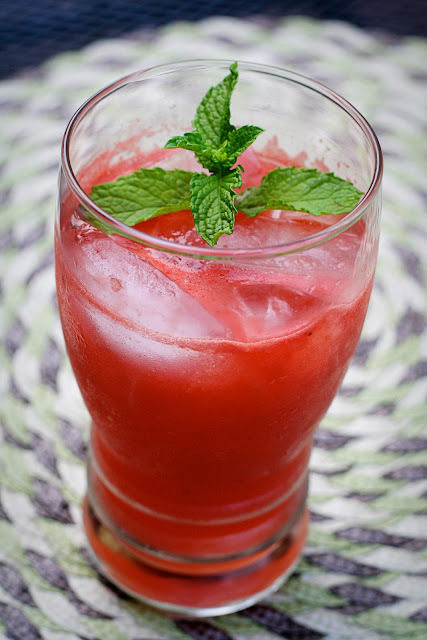 Watermelons are plentiful right now, so RUN to the grocery store and grab one, along with some limes, club soda, light rum, and (if you don't have an herb garden with mint) some fresh mint. I saw this recipe by Cookin' Canuck by way of Aggie's Kitchen, a cooking blog I regularly follow. I followed the recipe exactly, except I like a little fizz in my Mojito's so I topped mine off with some club soda. This recipe makes enough for 2 large drinks, so if you're planning to drink a lot of these (which you will after you taste them) you'll want to double or triple this recipe. I made the drink base and put it in one of my grandmother's vintage ball pitchers (isn't it pretty?) and kept it in the fridge until we were ready to combine it with the club soda. In a small pitcher, combine fresh mint leaves, sugar, and lime juice. Using the handle of a wooden spoon, muddle the ingredients to release the oils from the mint. Take care not to muddle to the point where the leaves fall apart. 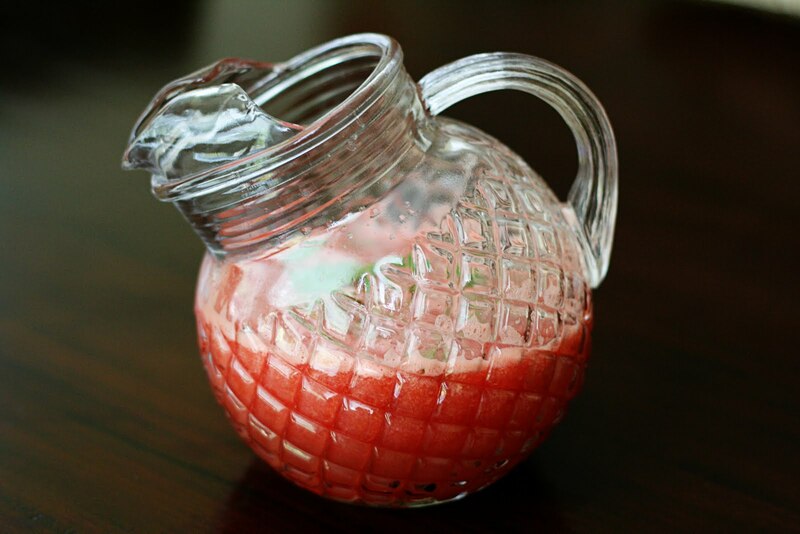 Pour rum and watermelon puree into the pitcher and stir gently. Fill a tall glass filled with ice about 2/3 full of the drink base and top with club soda. Stir and enjoy! I would like one of these this weekend - you need my opinion in case you need to tweak this recipe. It might take several. Yum! I wish I were up there to share!